Many of the members of Cycle Bath turn up to Sustrans Volunteer events and work parties on the local NCN (National Cycle Network). Support includes volunteering at events such as BikeBath or maybe on a stall such as at the Relish Running Two Tunnels day. 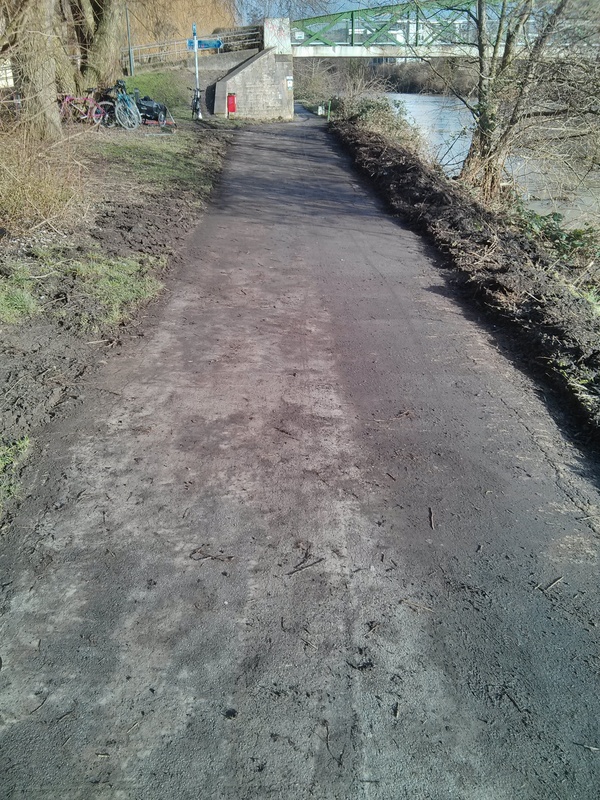 Work parties over the winter can be messy work, but make a real difference to the cycle paths in and around Bath. If you turn up, expect to get dirty for a few hours along with the offer a biscuit! Events, work parties and meetings are listed in our calendar. Twelve volunteers re-exposing over 1 metre width of the overgrown river path near Locksbrook. Over 3,500 volunteers currently help Sustrans. We’d love you to join us! Our volunteer groups and staff advertise for specific roles as and when they are needed. If you can’t see what you are looking for, then email volunteers-uk@sustrans.org.uk with information about your skills and interests, the time you want to give and where you are based, and we’ll get back to you. Please note our volunteering is available to over 18s only, unless otherwise stated in the vacancy. Sustrans’ volunteer programme is grateful for financial support from the Big Lottery Fund People and Places programme, Environment Wales, Keep Wales Tidy Local Environmental Quality, Scottish Government, Scottish Natural Heritage, Welsh Assembly Government’s Active Communities Fund (via WCVA), many local authorities and the following Charitable Trusts: The Barbour Foundation, The Cory Environmental Trust in Britain, The Craignish Trust and The Poling Charitable Trust.